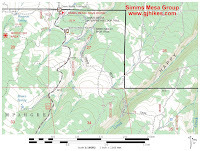 The Simms Mesa Aspen Grove trail, aka Simms Spur, is located in the Plateau Division of the Uncompahgre National Forest near Montrose, Colorado. The trail begins off of the Simms Mesa trail where it descends a draw down one side of a hill and loops around to the draw on the other side of the hill where it climbs back up to the Simms Mesa trail about a third of a mile from where it began. 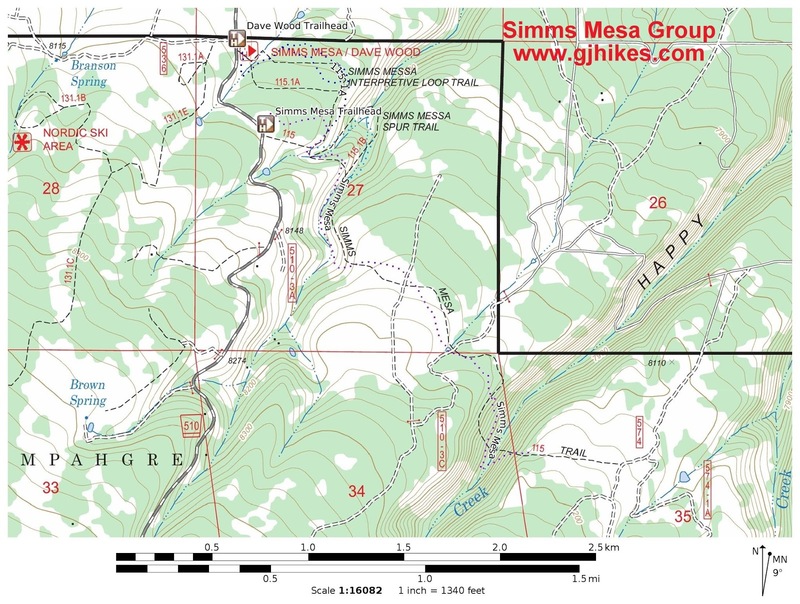 For this post we are beginning at the 0.6 mile point of the Simms Mesa trail. The trail starts out on the right hand side of the draw as it heads eastward away from the Simms Mesa trail. Rather than staying in the bottom of the draw the trail travels along the hillside just above it. During the fall pin cherries and chokecherries can be found in this area. Early in the summer you can enjoy seeing their blossoms instead of their fruit. Some time in the past the Aspen Grove trail may have been part of the Dave Wood Interpretive trail. It has numbered posts that seem to carry on from the numbering of the Simms Mesa Connector. The relics now serve well as trail markers that help hikers to stay on the correct route. At the 0.3 mile point the trail ends up back in the draw where deer, elk and bear have left their tracks in the mud around a slough. Going in this direction it isn't entirely clear at what point to cross the wash and head up the other draw but once you do cross over it isn't too hard to find the trail again. The important thing is to not go too far down the drainage before crossing the wash and heading back up the other side. Once the trail starts climbing again it is pretty easy to follow the rest of the way back to the Simms Mesa trail. The prettiest groves of aspens that you get to hike through are at the two ends of the trail. They aren't very big but nice nonetheless. The Aspen Grove trail meets back up with the Simms Mesa trail at a point that is about 3 tenths of a mile from the Simms Mesa trailhead and about 3/4 of a mile from the Dave Wood trailhead. On the day that we were taking the photos for this post we came across 2 groups of people that had both started out from the Dave Wood trailhead and were hiking the longer route. 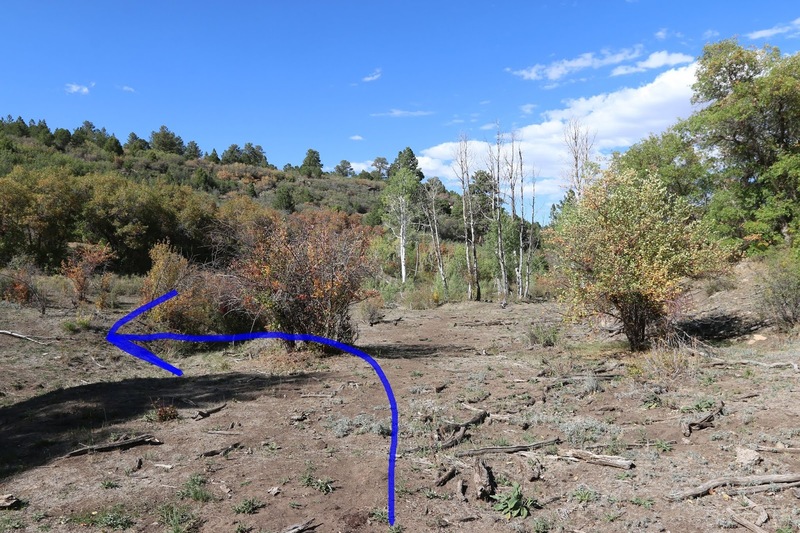 The Aspen Grove trail is probably a better option for extending an outing that includes the Dave Wood Interpretive trail rather than as a destination all by itself. If you would like to see it for yourself then all you have to do is 'Take a hike'.